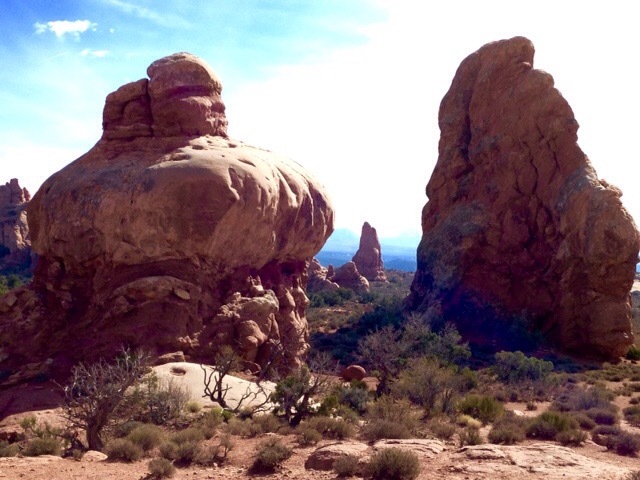 Today is the day I’ve been waiting for, going to Arches Nat’l Park. 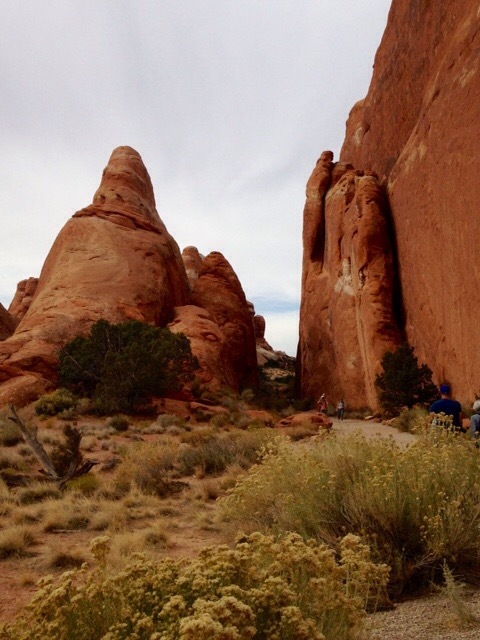 Today was an off-the-bike day because hiking is the only way to see the arches. We set off after breakfast with blue, sunny skies-another flawless weather day. Entering the park was like walking on to another planet from a million years ago. 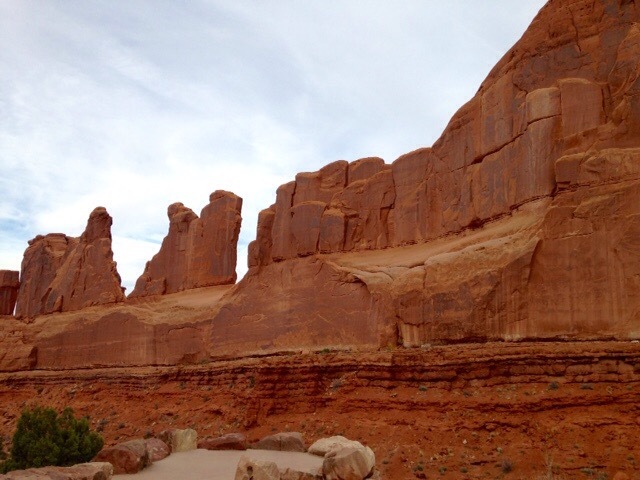 The massive rock formations were everywhere. One scene I really liked were the petrified sand dunes. They don’t make for a very pretty photo but it’s pretty interesting that this place at one time looked like the Sahara Desesrt. Now the sand dunes petrified and remain here. 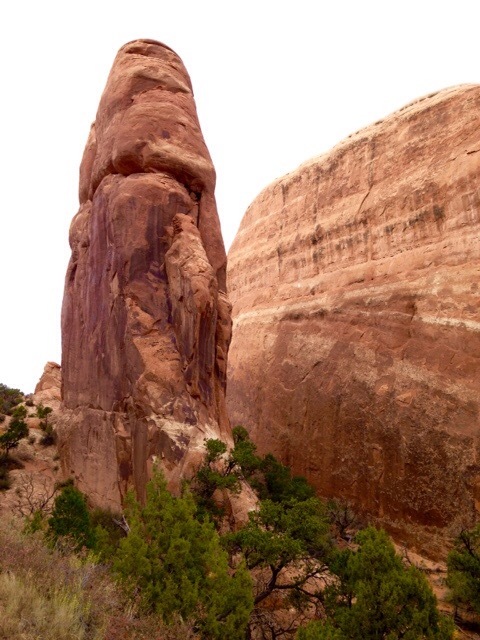 Next was Balanced Rock. 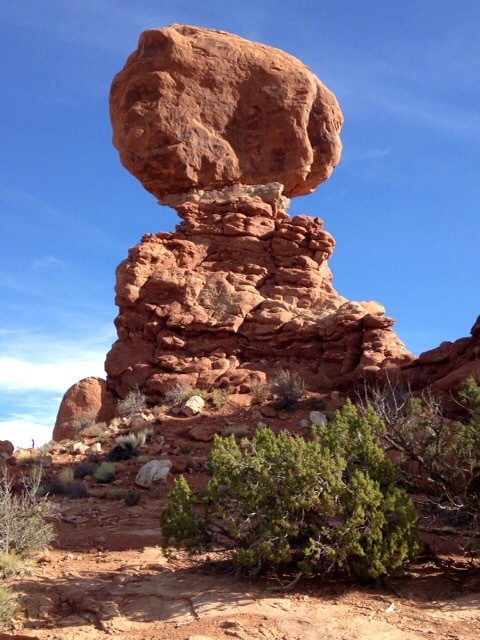 The rock on top that looks like it’s defying gravity is a hard Slick Rock. 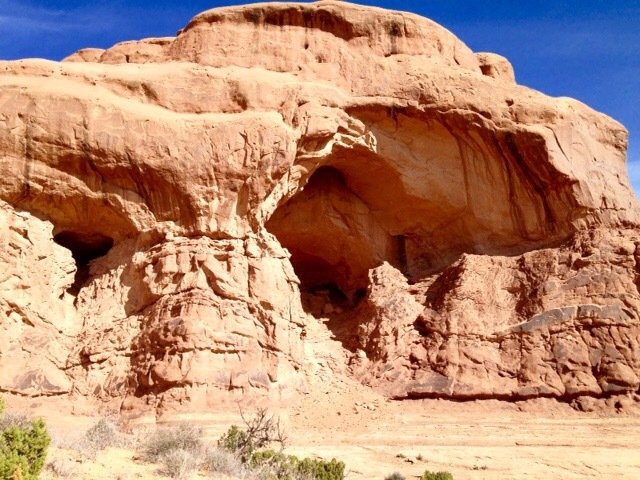 Its perched on a pedestal of mudstone which is much softer so it erodes faster. 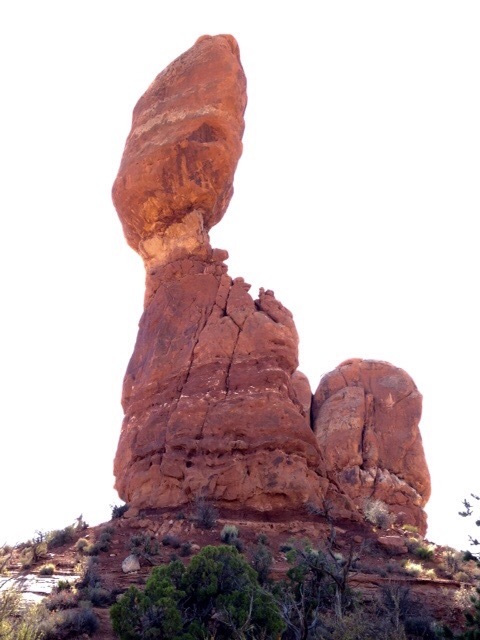 Eventually, it will cause the collapse of Balanced Rock. These shots I took are from opposite sides. Ok by now you’re probably wondering, where are the arches? 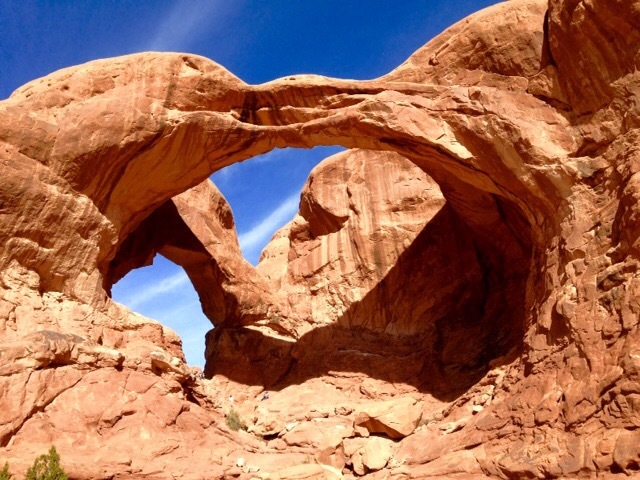 The park has over 2,000 cataloged arches that range in size from a 3 foot opening (the minimum considered an arch) to the longest (Landscape Arch), measuring 306 feet from base to base. 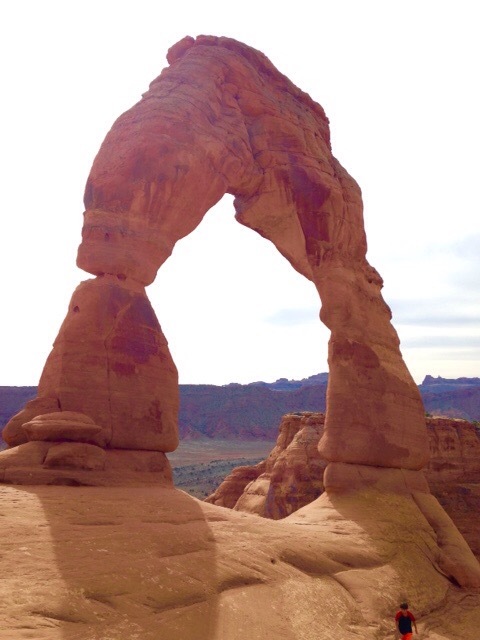 The first one we saw was Double Arch. The second photo is an arch in the making. Hiking on down a bit further, was North Window and South Window. South Window was my favorite of the two. 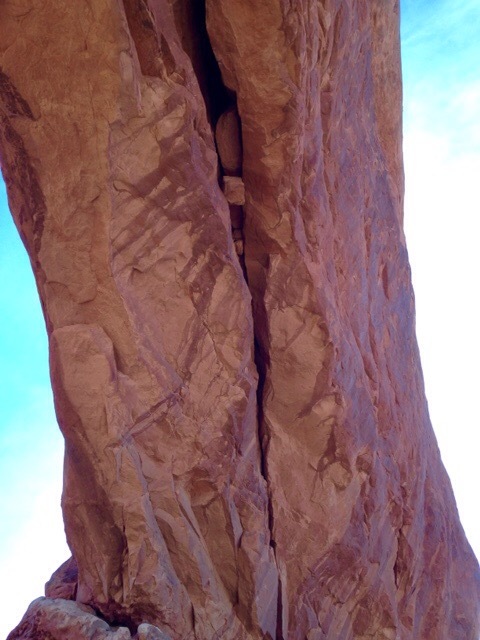 Notice the photo of the crevice under the arch (third photo). 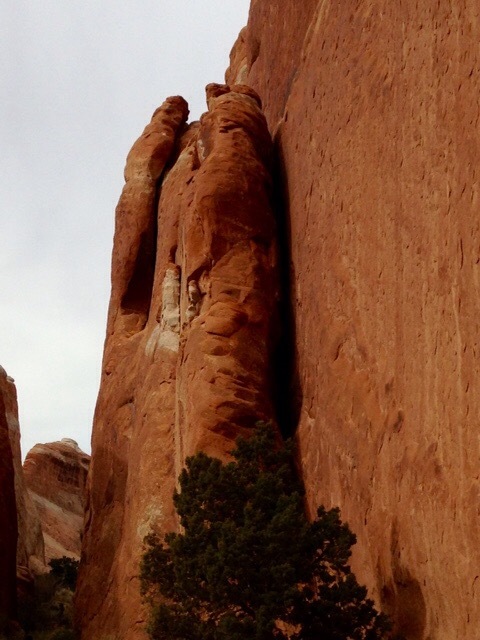 While it looks small in the photos, those are huge boulders hanging overhead. Gulp. 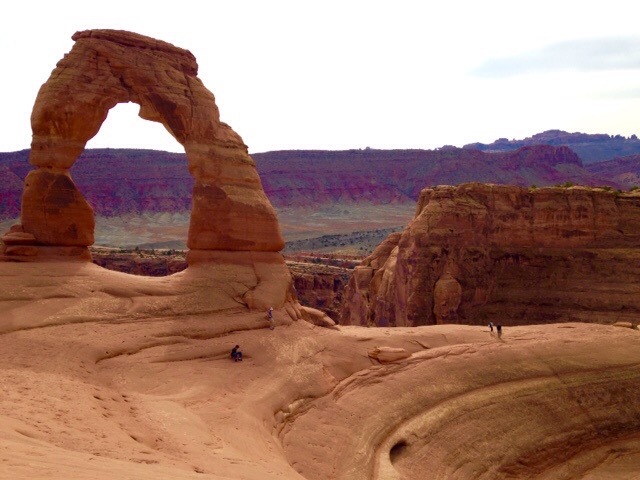 Lastly was the big finale, Delicate Arch. 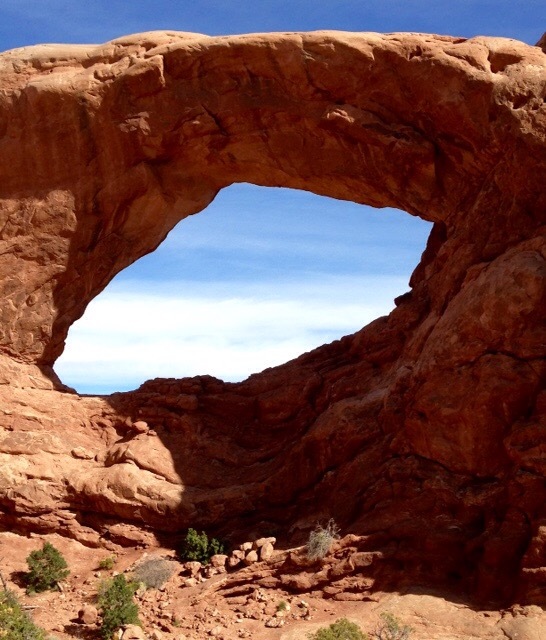 This arch is the icon of Moab. You even see it on Utah license plates. It’s not easy to get to (steep slick rock, standing on the brink of a canyon) but well worth the hike. I’m not sure how long it took me to hike it–maybe an hour and a half? 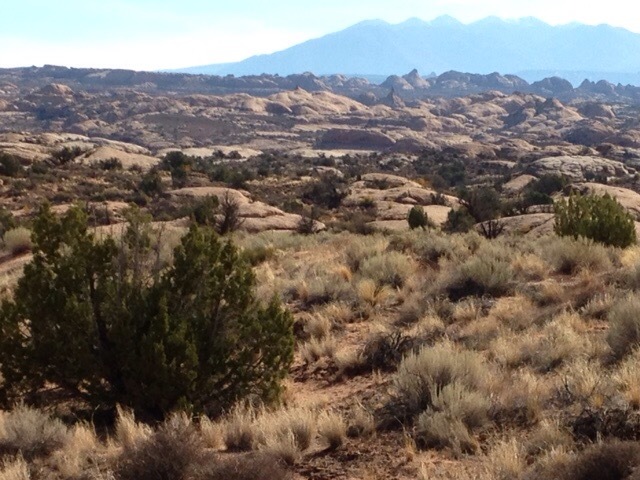 I was lost in the beauty of the desert. I rounded the corner and there it was. 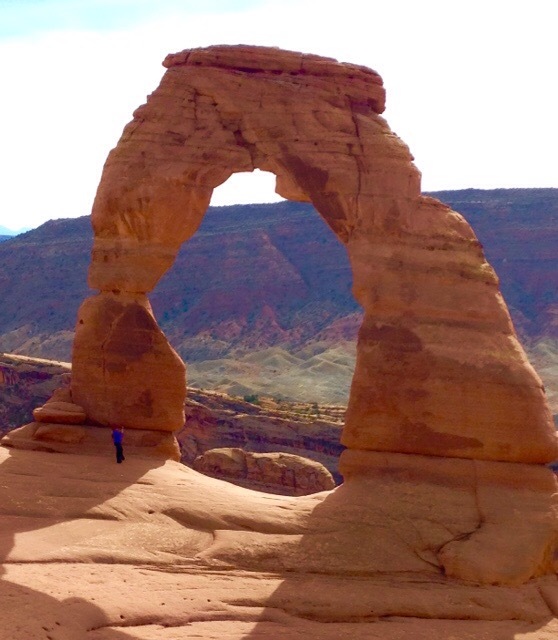 I didn’t realize my camera was on and it took an accidental photo of me the moment I saw Delicate Arch. My face says it all. A mixture of awe, delight and amazement. This was the highlight of my day, but I still had one more arch I wanted to see. 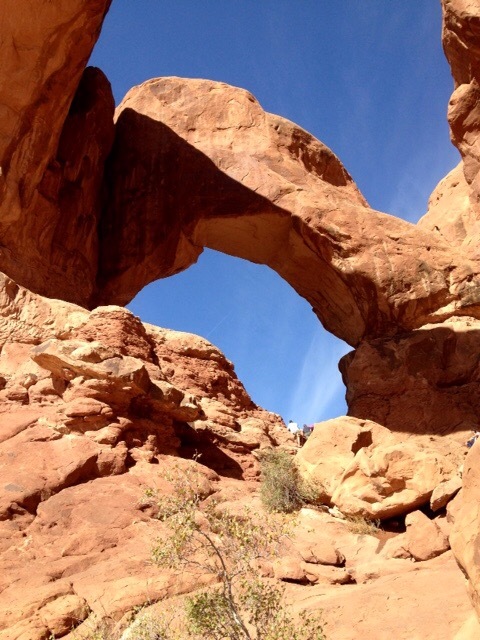 I hiked back downto Landscape Arch. As I mentioned before, this one is the longest arch in the park (306 feet from base to base). 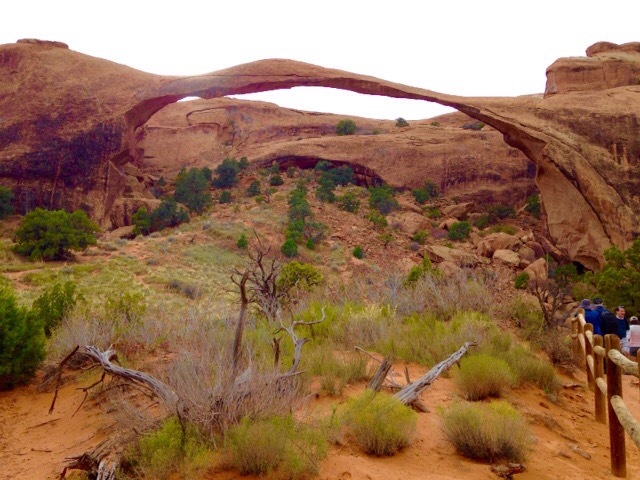 In 1991, a 60 foot long rock slab fell from the underside of Landscape Arch. Visitors who witnessed it (standing under it) said it sounded like a crack of loud thunder. Luckily they were able to get out of the way before it fell. 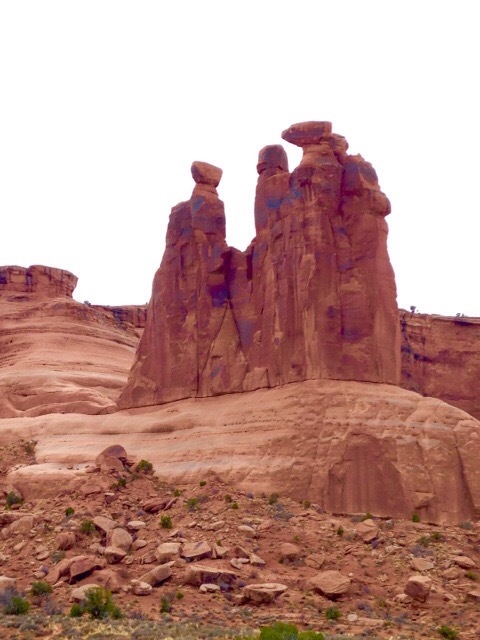 On the way out of the park, we saw this rock formation called “The Gossipers”. I only saw a handful of the arches today, but what I saw, will stick with me for a lifetime. If you have a bucket list, put this place on it. 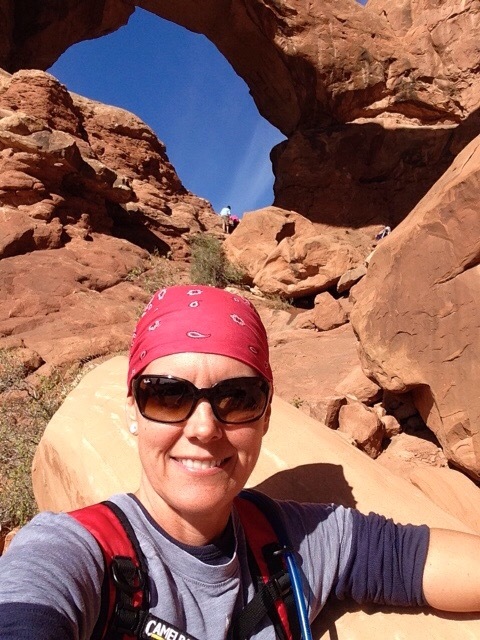 Another amazing day day in the desert! 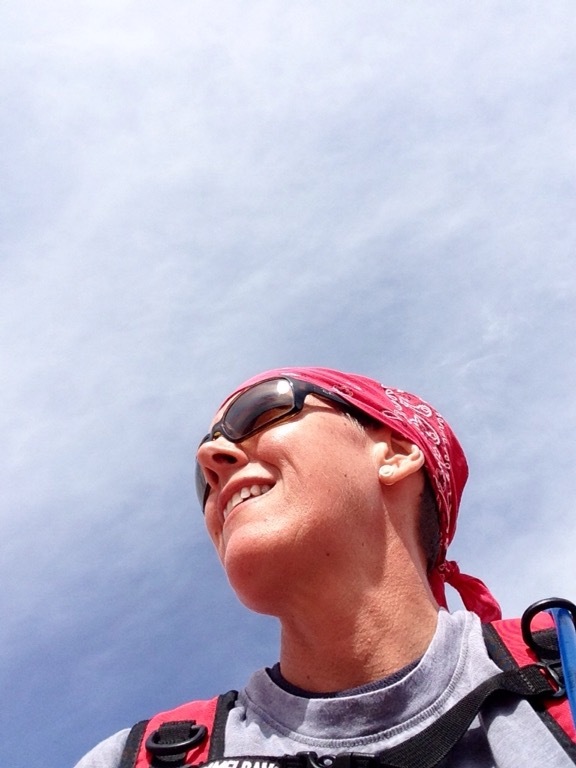 My parting selfie may look tired from the hike, but my soul is definitely happy. I love the accidental selfie. You got some gorgeous shots. I must get there. I was there in July and at over 110F degrees that day it was just too hot to hike up there in full gear motorcycle gear. okay, I’ve NEVER seen anything like these arches! Sedona doesn’t have squat on them! They sure are awesome. Great photos! Once again, jealous! 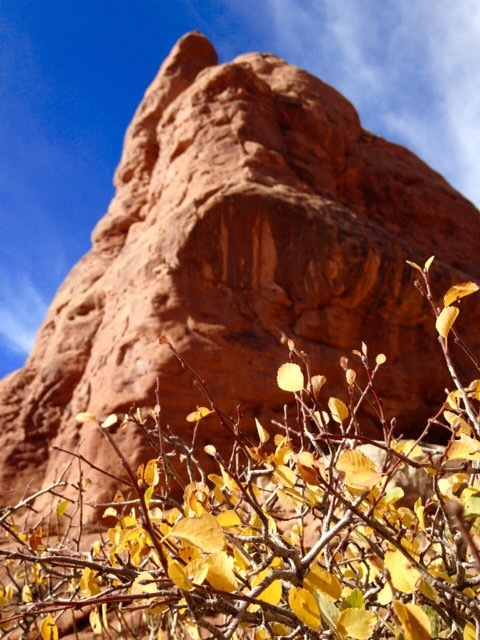 Arches is a beautiful place. 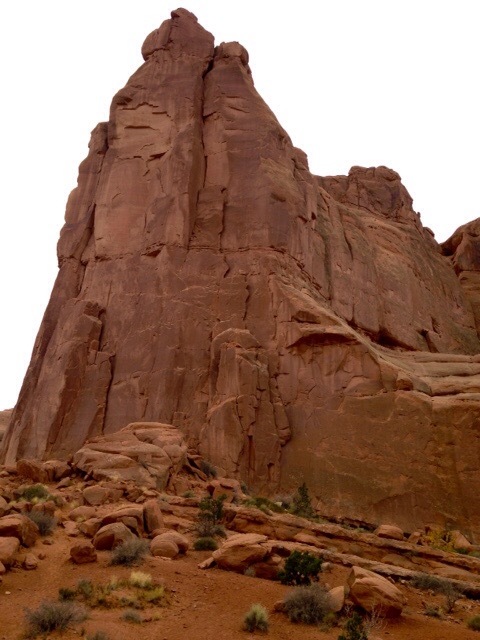 I have photos of Delicate Arch that I took from a 2010 trip hanging in my office, and Edward Abbey’s Desert Solitaire sits on the shelf in plain view under one of the photos. Your photos are awesome! Thanks so much! That’s really cool you have a photo of ith with Abbey’s book near the photo.